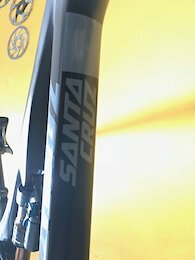 This is a size large Santa Cruz Bronson (2016). This bike is in excellent condition and has a heap of top-of-the-line upgrades. I have taken very careful care of this bike and it's in almost new condition. First, the bike is a 2016 Bronson. This bike is probably one best trail bikes you could get for Colorado. It climbs amazingly well and feels incredibly comfortable on any kind of downhill. This bike can handle the bumpy rocks like a champ, but also feels very safe on big drops and swoopy turns! If you are looking for an amazing, light (sub 29lbs) full carbon rock gobbler, this is about as good as it gets. I have cleaned, rebuilt, and maintained this bike to the highest standard. New suspension links with fresh bearings, rebuild the hubs on a schedule, clean the bottom bracket and the headset. 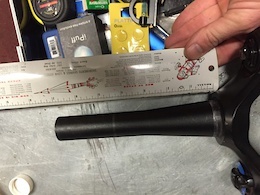 Here are the specs: Size: Large (probably good for 5ft 9in to 6ft 2in) Drivetrain: 1X12 Eagle XO1 derailleur X01 shifter Chain has less than 30 miles on it X01 Cassette (the $300 high-end cassette that is 1/4 lb lighter) 30mm diameter SRAM cranks (175 mm long) Wheels: Ibis carbon EXTRA wides (35mm internal width) Chris King hubs front and rear (recently rebuilt and lubed) Fork: Rockshox Pike, upgraded to 160mm travel with recent rebuild Shock: Fox Float X w/ Kashima coat. Rebuilt and tuned by Push for Colorado (rocky) conditions Bars: Santa Cruz carbon 800mm Dropper: Fox Transfer 150mm infinitely adjustable post Tires: Maxxis Minion DHF 2.5 WT Brakes: SRAM Guide RSC I will ship this bike to you in the continental US using a reliable, and insured, system and charge you only the cost of shipping, packaging, and insurance (no handling fees).